Do you work in human resources for a construction company? Then you're likely already aware of these top four issues. But do you know how to solve them? That's what we'll discuss in this section. The search for top talent is a problem just about every company faces. But for organizations in the construction industry, the issue seems to be amplified. There are numerous reasons for this such as the common perception that construction jobs are low paying, dangerous, and strenuous; and the fact that, for many construction jobs, a qualified candidate must be in possession of a unique combination of skills and/or certifications. In order to combat this, it's essential that HR professionals in the construction industry maintain a healthy pipeline of potential employees at all times — even when their company isn't hiring. By using a full-featured applicant tracking system that integrates with your company website, favorite job boards, and social media sites; you'll put your business in the best position to attract quality workers. But finding top talent is only half the battle. You might also have to compete against a multitude of other construction companies in your area to win their services. To give your organization an edge, make sure you're able to offer enticing salaries and benefits packages to each worker you hope to hire. In the construction business, worker safety is a constant concern. If your company neglects to take important safety precautions, it could be at risk of high medical bills, rising workers' compensation fees, and even lawsuits from the injured party. While it's impossible to completely remove the risk of harm from a job site, there are things that HR departments can do to reduce the likelihood of employees sustaining significant injuries while working. First, always emphasize the importance of safety and make sure that the supervisor or foreman in charge understands the value your company places on a safe work environment. Second, make sure that any employees operating machinery or dealing with potentially hazardous materials have been properly trained. Finally, ensure that solid safety protocols not only exist, but are understood by your workers and can be enacted should the need arise. Supervisors should know exactly what to do in the event of a workplace injury. Related to worker safety, rising workers' compensation costs can greatly restrict a construction company's ability to operate efficiently and grow. By implementing safety standards and procedures, you'll reduce the risk of injury, thereby protecting your company from large workers' comp fees. But there are other steps you can take as well. For example, you could consider implementing a return-to-work program at your company that proactively helps injured employees return to their jobs — at least at a limited capacity — in the shortest amount of time possible. This could greatly lower the amount your company pays in workers' comp fees. 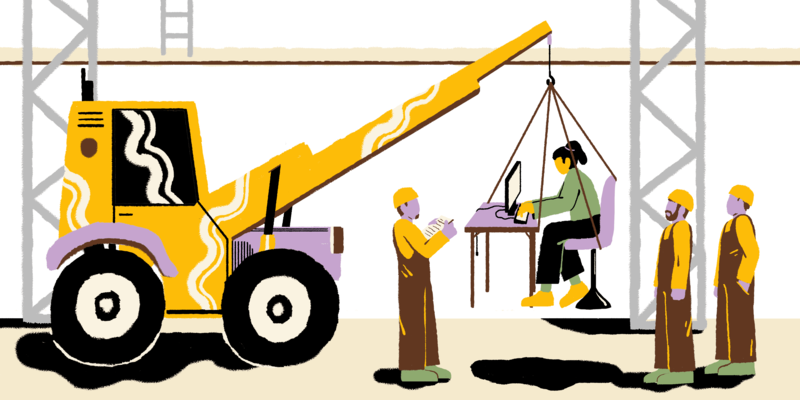 Since finding and hiring talented employees is one of the main problems HR professionals deal with in the construction industry, doesn't it make sense to do whatever it takes (within reason, of course) to keep the skilled workers you've already hired? Of course it does! To reduce employee turnover, make sure you're able to offer your employees competitive wages and benefits packages, safe and appealing working environments, and ongoing training. This will help them appreciate working for your company and increase employee engagement with your organization. There’s a lot to be excited about in the construction industry. But there are also specific issues that HR teams must be aware of and address. As a HR professional, if you can discover ways to find more qualified workers for your company, maintain worker safety while lowering worker compensation costs, and reduce employee turnover, you’ll become incredibly valuable to your organization.